The following is NATO/ISAF’s strategic communications framework for operations in Afghanistan. Though unclassified, NATO doctrine and policy documents are not released to the public. NATO/ISAF engagement in Afghanistan in 2010 was characterised by a refreshed, comprehensive civ-mil strategy as reflected in a substantial force uplift, significant progress in the growth and development of the Afghan National Security Forces, and discernable campaign progress in priority districts. 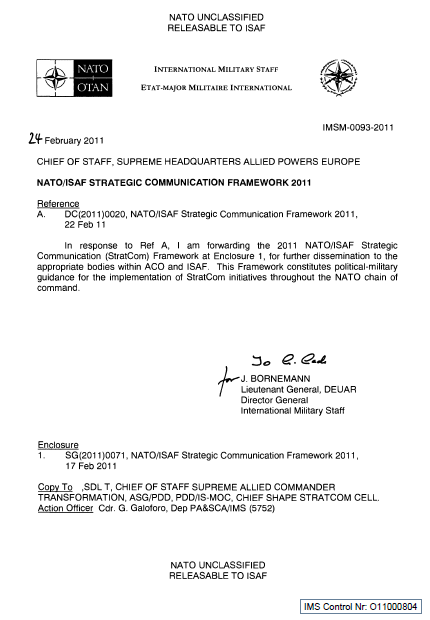 These were reflected in the NATO/ISAF Strategic Communications Framework 2010 (Ref A). In parallel, political events, including the London Conference, the Consultative Peace Jirga, the Kabul Conference, Afghan Parliamentary elections and the NATO Summit in Lisbon, helped define a clear political roadmap for Afghanistan. These developments are reflected in the Lisbon Summit Declaration which provides political guidance for the focus of our efforts in 2011(Ref B) and reaffirms that NATO’s mission in Afghanistan remains the Alliance’s key priority. Reference B also reflects the priorities outlined in the Kabul Conference (Ref C), including: setting conditions for and beginning Transition, as expressed in the Joint Inteqal/transition paper (Ref D); and developing an enduring NATO and Afghanistan partnership demonstrating the Alliance’s longer-term commitment beyond ISAF’s current mission (ref E). At Lisbon, the Nations also strongly reaffirmed the necessity of a comprehensive and regional approach, fully supported by the international community, to achieve a successful outcome. Aim. This paper sets out the NATO/ISAF Strategic Communications Framework, based on the Lisbon Summit political guidance, providing the top-level political-military context and guidance to steer NATO/ISAF activities in the communications and information environment in 2011.
a. Communicate that stability in Afghanistan is crucial to global security and that NATO/ISAF will never again allow Afghanistan to become a launching pad for international terrorism. b. In coordination with the Government of the Islamic Republic of Afghanistan (GIRoA), explain and gain support for Transition. c. Generate the active support of the Afghan people, the GIRoA, Troop Contributing Nations’ (TCNs) populations and International Community for the ISAF mission. d. Promote NATO’s long-term commitment to Afghanistan in close coordination with GIRoA (ref E). e. Communicate progress against ISAF campaign objectives and priorities, articulated in theatre-defined measures of effect. f. Diminish support for the insurgents and criminal patronage networks that are detrimental to the ISAF mission and effective Afghan governance that commands public confidence. Resolve – We are realistic about the challenges we face and our goals. At the Lisbon summit NATO/ISAF reaffirmed a resolve that has been demonstrated over the last year by increased forces, resilience in the face of casualties and a high and effective pace of operations. Maintain momentum – The effective implementation of our strategy has enabled ISAF and its Afghan partners to increasingly recapture the initiative creating momentum towards success that we will sustain. Partnership – NATO’s support for Afghanistan will continue beyond the end of the current mission through an enduring partnership. The Afghan people can have confidence in the long-term support of their international partners. NATO/ISAF will work closely with Afghan and international stakeholders, both civilian and military to achieve a stable Afghanistan within a stable region. Afghan Lead – The clear and sustained strategy of NATO-ISAF and its partners will enable an irreversible transition to Afghan lead. As transition is implemented, the Afghan Government must take increasing responsibility in all areas, including being responsive and accountable to its public.